A portrait of Empress Maria Feodorovna by Kramskoj. Marie Sophia Frederika Dagmar was born on November 26, at the Yellow Palace in Copenhagen. She was the second daughter and fourth child of Prince Christian of Schleswig-Holstein-Sondenburg-Glucksburg, a minor German prince, and Princess Louise of Hesse-Cassel. The Glucksburgs, as they were commonly known, lacked either the territory or the fortune to raise their children in a regal manner. While the family lived a rather unostentatious and pious life, Dagmar and her siblings enjoyed the carefree environment upon which they were brought up. At the time of her childhood, little did Europe know that Prince Christian and his children would populate the thrones of Denmark, Norway, Greece, Russia, Great Britain, Hannover, Romania and Spain. The Glucksburgs' fortunes changed for the better when the scandal-prone King Frederick VII of Denmark recognized Prince Christian as his successor in 1852. While Christian was not the closest heir to the Danish throne, the Great Powers believed that he was the “least compromised” in European entanglements. This also improved the prospects of Prince Christian’s children of marrying into the royal houses of Europe. The year 1863 was significant for Dagmar and her family. Her sister, Alexandra married Albert, Prince of Wales. Their brother, William, was elected King of the Hellenes. Finally, King Frederick VII died and Christian became king as Christian IX. The status of the House of Glucksburg in Europe was immediately propelled in line with other, prominent European houses. By the end 1864, at the behest of Dagmar’s mother, Queen Louise, Dagmar was betrothed to Nicholas, eldest son of Alexander II, Czar of Russia. However, heartbreak struck Dagmar after Nicholas’ untimely death in 1865. Nevertheless, Czarina Maria Alexandrovna took a liking to Darmar and decided she should marry the new heir to the throne, Grand Duke Alexander Alexandrovitch. Unknown to Dagmar, Alexander was already in love with her and she eventually fell for him also. They were married on November 9, 1866, and she was known thenceforward as Marie Feodorovna. The couple had five children: Nicholas, who became emperor as Nicholas II; George (b. 1871), who died at the age of 23; Xenia (b. 1875), who married the Grand Duke Alexander Nikhailovitch; Michael (b. 1878), who was tsarevich from 1881 until the birth of a direct heir to the throne in 1904; Olga (b. 1882), whose marriage with Prince Peter Oldenburg was dissolved during the war. The grand duke succeeded to the Russian throne as Alexander III, in 1881, after his father was assassinated by the Russian extremists. In her diary, Maria vividly described the state of the emperor, who was immediately rushed to his palace after the incident: "His legs were crushed terribly and ripped open to the knee; a bleeding mass, with half a boot on the right foot, and only the sole of the foot remaining on the left." While Maria had every trait that made her ideal for the role of Empress-Consort, she was not pleased of their new roles. She wrote: "Our happiest and serenest times are now over. My peace and calm are gone, for now I will only ever be able to worry about Sasha." Alexander and Maria were crowned at the Kremlin in Moscow May 27, 1883. A plot to assassinate the new czar was uncovered, causing major alarm for the new czar and czarina’s safety during celebration. Nevertheless, over 8,000 guests attended the splendid ceremony. Fearing for their lives, the Romanovs moved their residence to Gatchina Palace, located some 50 kilometres away from St. Petersburg. It was at Gatchina that their five surviving children grew up. The empress’s home life was a happy one and she was content not to take part in any political matters. Her husband, meanwhile, took every precaution their safety amidst the many threats in their lives. Alexander was a conservative ruler who reversed some of the liberal reforms of his father. Upon his accession, he heeded on Pobiedonoszeff’s advice and refused to accept the Constitution prepared by his father. As his accession to the throne had never been expected, he had been trained as a soldier, and had little political knowledge or ability. 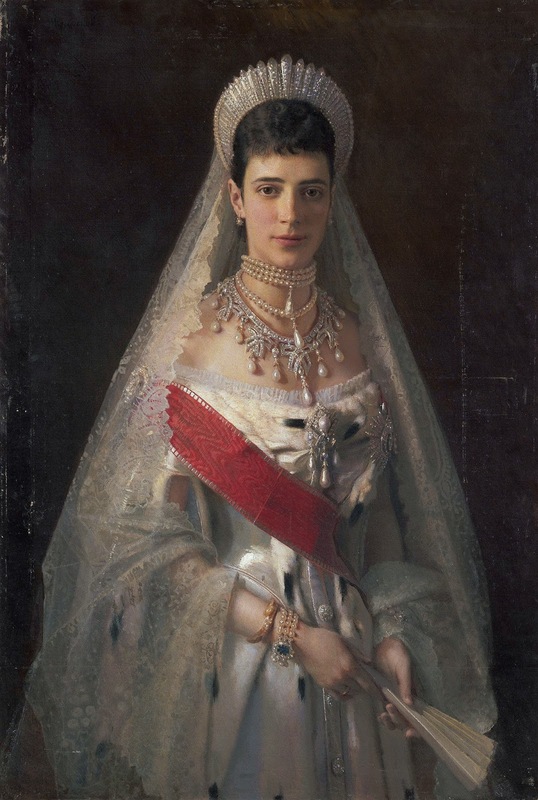 His legacy lies in that fact that during his reign, Russia fought no major war, thus, earning for him the moniker "The Peacemaker"
Maria, meanwhile, was hailed for his impressive sole role as an empress, hosting glamorous Imperial balls and becoming increasingly popular in Russia’s circle. Her daughter, Olga said: “Court life had to run in splendor, and there my mother played her part without a single false step.” She also spent time promoting causes dear to her, such as philanthropy and education. As head of the “department of the institution of the empress Marie,” she extended the work of the institution, establishing new schools, hospitals and relief centers of various kinds. She endeared herself to the people of Russia by her personal interest as well as by her wide philanthropic activities. She was trained as a nurse during the Russo-Turkish war, and greatly developed the Russian Rd Cross organization, of which she was the head. In 1894, another blow hit Dagmar after Alexander III died. In 1894 Alexander III terminally ill with nephritis. The imperial couple decided to head for Greece in hopes that the warmer weather would prove beneficial for Alexander. They were only however able to make it until Livadia since Alexander became too weak to travel any further. There, Alexander III breathed his last on November 1, 1894. Maria poured her grief in her diary, writing: "I am utterly heartbroken and despondent, but when I saw the blissful smile and the peace in his face that came after, it gave me strength." Maria emerged from her grief at the onset of her son’s reign to keep an eye on Nicholas II. She took a more active interest in the affairs of the state and her daughter, Grand Duchess Olga, noted: “She had never before taken the least interest … now she felt it was her duty. Her personality was magnetic and her zest of activity was incredible. She had her finger on every educational pulse in the empire. She would work her secretaries to shreds, but she did not spare herself. Even when bored in committee she never looked bored. Her manner and, above all, her tact conquered everybody." Maria also believed Russia needed reforms to avoid any revolution. The empress dowager's influence on her son eventually waned after his consort, Alexandra Feodorovna, produced an heir, the czarevitch Alexis Nicolaevich in 1904. During this time, she spent more time abroad, especially in England and in Denmark, where she and her sister, Alexandra, brought the Villa Hvidore. In Russia, she remained in Anitchkov palace as her residence. There months after Rasputin’s murder the revolution broke out and the emperor abdicated. The empress Marie, who was at Kiev, met him for the last time at Mohilev. She was permitted, with other members of the royal family, to live in the Crimea, under close guard. When the Crimea came under German occupation she was given the opportunity of returning to Denmark through Germany, but refused, and only left for England after the armistice in April 1919. During her later years she lived at Hvidore, in Denmark; she died in Copenhagen on Oct. 13, 1928.